This conversation reminded us that we are often willfully or unconsciously not fully present when preparing for the future. Inherent in assumptions of working with strategy is that strategy is “all about the future”. We are often invited to hold or facilitate “blue-sky brain-storming” or to help prepare scenarios for “The [insert organisation name] 2025 Vision”. John and Pam’s exchange got us thinking that rather than just accept the notion that we need to separate the future from the past and present, perhaps we needed to consider a more helpful way of working on strategy. – we start to feel creative, powerful and omnipotent when unencumbered from the heavy responsibilities of day to day delivery, thus forgetting that we exist in an emerging present (George Santayana) and we can participate in the future but not change it (David Lewis). – it breaks assumptions about what’s possible by unhooking us from the assumptions restricting our thinking. Note: Dan Gilbert challenges our ability to do this by arguing that we under-estimate our change in interests, views and preferences because we often find it difficult to imagine a future for ourselves that is different. – we end up only paying attention to data signals from users, customers and the market which confirm our intended future (termed confirmation bias by Wason) and therefore miss opportunities and threats. – we ignore the organizational myths and rituals from the past which could shape or frame the perception of future possibilities – e.g. “we tried to offer services ten years ago and it nearly killed us”. – we pay insufficient attention to the possibilities inherent in what we are currently doing. It could be a current product, service or capability which could become the revenue stream of tomorrow. An example of this is how Amazon Web Services was transformed from being a back office enabling function supporting the Amazon retailing business to a significant and fast-growing business stream in its own right. This encouragement to separating ourselves from the murky, complex nature of our present realities often ends in strategies being described post-hoc as resulting from hallucinations, not visions. The gap between what middle managers in organisations experience in the present and the idealized nature of the vision is often too great to be credible, increasing the likelihood of cynical conversations at the water-cooler. William Gibson’s suggestion that “the future is already here — it’s just not very evenly distributed” suggests that we need to pay far more attention to opportunities and signals in the present, from both within and outside the organization. Well, there are strategy processes that do indeed enable participants to both stay present and build a compelling and connected future. An example of such a process is Future Search (Weisbord & Janoff), which helps organization participants build a compelling future by paying sufficient attention to the opportunities in the present. It encourages participants to look at common ground to build a compelling organisation future. 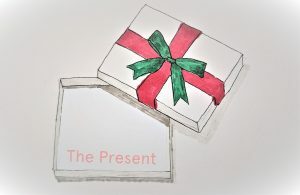 However, even if we don’t choose one of these approaches to building our strategy, we can all question whether we really are present enough when preparing for the future. Lewis, D. (1976) “The Paradoxes of Time Travel.” American Philosophical Quarterly, 13:145-52. Macmillan, I. Extract from a poem read on a BBC Radio 3 programme but not otherwise published. Permission provided by author to use the quote in this blog. Weisbord, M. & S. Janoff (2010). Future Search: Getting the Whole System in the Room for Vision, Commitment and Action. San Francisco: Berrett Kohler.